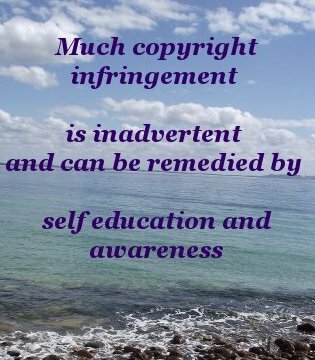 In a sentence, copyright infringement is reproducing an existing creative effort, or any part thereof, by whatever means, for whatever purpose, without express permission from the copyright holder. The only exception to this is Fair Use. Much infringement is inadvertent and can be remedied by self education and awareness. This is not an option but an absolute necessity. Responsible behavior always obviates legislation. 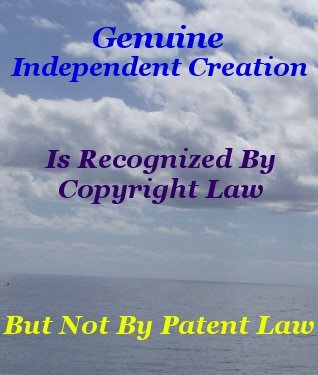 Keep in mind that if you are copying something, and that means anything, including text and graphics, it is most likely copyrighted. Your most effective defense against falling prey to copyright infringement is to be original. This, of course, is difficult. But the pay-off is well worth the endeavor. A small price to pay. Being original demands mental exertion. Willingly furnishing exertion is an indication of a true thinker, and the reason why true thinkers will always be in demand. Not so copiers. One can safely take for granted that everything is copyright whether designated so, or not. It is no longer necessary to explicitly indicate copyright status. There happens to be two excellent reasons to do so however. Helping to educate newcomers, and keeping the rest of us aware that creative efforts belong to real Humans just like you and me. Designation is a simple matter of displaying the copyright symbol in a prominent position on a work. The easiest way to understand the implications of Intellectual Property Rights Law is to be consciously aware that all the amazing stuff that contributes to our lifestyle is produced from the Human imagination. By dint of creative effort, and actually belongs to someone. You, me, or one of our fellow Humans. It is this belonging that is protected by law. 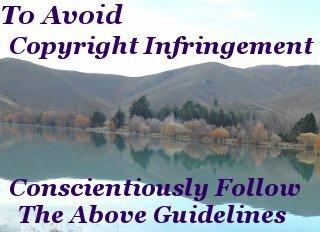 To avoid copyright infringement, conscientiously follow the above guidelines. In the simplest of terms, if I don't have clearance, I am in violation of copyright law and infringing. Makes one wonder why copyright law is so complicated. That is a question on many folks lips. This is a legitimate question that ably answers itself when we understand Human behavior. Natural Law contains all the answers to our behavior. 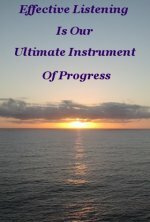 Personal Development is the means to understanding Natural Law, and hence ourselves. Fair use is aimed at educational rather than commercial purposes. If your sole purpose is to learn, teach, research, or you wish to merely criticize a work, or you are reporting the news, you may have a case to utilize fair use. Otherwise it is best to let sleeping dogs lie. When using fair use, it is perhaps better to seek legal advice if there is any doubt. Or just obtain permission from the copyright holder. This is a good place to remind ourselves that ideas are not protected by law. We can apply our own thinking power to those ideas we may find so attractively expressed by others. 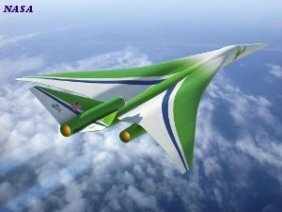 Alternatively, you can join the open source world, where, by adhering to and following a few simple and sensible rules, gaining permission to copy is certain and instantaneous. Genuine independent creation is where two or more people conceive and develop the same idea in relatively, if not absolutely, the same manner. Without the knowledge of another's efforts. This fact is one of the most fascinating aspects of the Human mind. Copyright law accepts the existence of such a phenomenon, and it can be used as defense against infringement claims. Copyright law clearly comprehends that ideas can be approached from a myriad of perspectives. And in the same spirit myriad artists can paint the same landscape. All that matters is that each effort is obviously an original exertion. Nonetheless this same law has taken a dim contrary view in less clear cut circumstances where the Human mind is solely involved in a creative effort. As a few well publicized lawsuits attest. Albeit disappointing, patent law does not recognize independent creation. Despite overwhelming evidence to the contrary, patent law insists on first past the post. Meaning the first applicant to secure approval, thus making inventing a risky game. Copyright protection is automatic, but, for a fee, some Governments offer copyright registration. This purportedly aids in court action when ascertaining the rightful owner and date of creation. Other Governments such as Australia, do not. I am on Australia's side in this one. To my mind, the growing perceived need and regular recommendation to register a copyright that provides protection in law the millisecond that a creative expression is fixed in a physical medium, is a symptom of a fearful society losing it's way.